Cephas is a quiet 15 year old boy. When he first started at Appleseed he was very shy, often showing acknowledgment with a smile and raise of the eyebrows. He has since become more comfortable and his English is improving, so he is beginning to talk more. Cephas is the 2nd oldest in a family of 4 boys.The mother said that she is grateful that the boys are now in school and that they get fed 2 meals a day. Before starting at Appleseed, they would often go a day without eating anything. 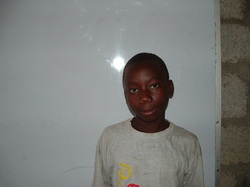 Recently, Cephas' older brother, who is about 18 years old has began attending Appleseed as well.